A version of this essay originally appeared in The Hudson Review (Volume XXIX, Number 3, Autumn 1976). I originally wrote the piece because I respected Bill Bradley’s basketball game, I admired his first book, Life on the Run, and I hoped he one day would enter professional political life. I’m now revising and posting the essay because I still admire his book, I respect his work as a United States Senator, esteem his enlightened campaign for the Presidency, and very much hope he one day soon will return to public office. With one or another level of ability most American men (and now many American women) have played and loved the game of basketball. We say “game.” But, like most sports, basketball offers itself to its players less as a game than as a mode of contact with those powers and limitations of body, judgment, and will that together comprise one form of the knowable personality. This phenomenon is not reserved just for the gifted. One of the great appeals of sport is that it encourages a democracy of sensibility among its participants. Every athlete, without respect to the quality of her physical resourcefulness or the subtlety of his interpreting consciousness, enters while engaging in play into essentially similar energies of philosophy, purpose, and practice. Skills vary widely. But the arc and art of athletics create a host of approximate equalities. The nature of this egalitarianism involves ethos as well as emotion. No one, no matter how blunt of mind, can play an athletic game merely as an exercise in entertainment or an errand of exertion. Sport’s choreographies of demand, its complicated and difficult requirements of attitude expressed in movement, make of its pursuits and proceedings a moral activity. As the word implies, athletic “recreation” involves for its participants not merely amusement and refreshment but, far more important, a willful impulse of redefinition: a comprehensive renewal and an elegant declaration of one’s experience of identity. Each time he accepts the assumptions and protocols of a game, each time she moves her mind and body in sympathy with a prescribed dramatization of human possibility, an athlete places into expression the accumulation of her consciousness and competency. In this sense the games of human sport, like the ritual forms of other animals’ play, elicit and depict the nature of our individualism within our species. For both public and private purposes of delineation and use, athletic recreation involves nothing less than the rediscovery and restatement of our personhood. So democratic is this experience of game, so general is this awareness of a sport’s ethical and aesthetic significance, that no entirely selfish communion with its systems is possible. Whatever varieties of self-aggrandizement, anger, or aggression we may direct against our opponents in contest, within every event of sport we feel joined to our antagonists in an elemental sentiment of connection and acceptance. For without the opposing self-definitions created by the other, we would be denied the surface against which we can fashion and declare our own. Similarly, and often exquisitely, we may create among our teammates in collaborative games extreme and elsewhere undiscoverable sentiments of unity. To explore within the constructs of a collective the patterns of our individual knowledge and the passions of our personal style, to produce one portion of a composite display of personality in performance, is to enter into an embrace of socialness that little else in our national, political, or spiritual life can provide. However temporarily, the primal bonds of this juncture almost always cross – indeed, they frequently explode – all frontiers of race, ethnicity, economic status, and every other nonsensically segregating cultural paradigm. Basketball no longer is an exclusively American sport. Numerous other nations now play and celebrate the game, many with immense skill. No other society, though, so exuberantly has embraced the game’s stunning possibilities for personal and social expression. Of all the world’s peoples, Americans most instinctively have felt drawn to the game’s mechanics and metaphysics. Basketball’s ceaselessly innovative repertoires of motion, mayhem, and magic captivate Americans’ ideals of identity. We love the game’s relentless demand for personal initiative seized from circumstances of fierce speed and enacted within overcrowded space. We love the game’s insistence upon the ceaseless substitution of improvised creativity for premeditated plan: the eruption of individualized invention in place of calculated and calibrated group action. We also love the game’s refusal overly to reward or excessively to penalize any individual instance of result. It requires consummate skill successfully to score a field goal, or to prevent one from being scored. But the sport awards little consequence to either occurrence; and, in any case, the occasions of the game are such that the most accomplished achievement of person or team perforce will become reproduced in its final effect of points by the most fortuitous happenstance. A lucky bounce here, a garbage rebound there, a clumsy put-back, a wing on a prayer, will mean every bit as much as any feat of brilliance. I think American players and audiences respond so potently to basketball because we share an unspoken conviction that the game reproduces in metaphor and manageable scale many of the defining opportunities, fulfillments, and burdens of American life. The game places premium similar to that of our culture upon brutally arduous pace, self-control and self-release, the husbanding of resources amidst their constant expenditure, the continuous expression of selfhood within the confining sanctions of the civic, the exciting sense that everything about our life is vitally important and our conflicting awareness that everything about our existence may be momentary, trivial, and possibly absurd. 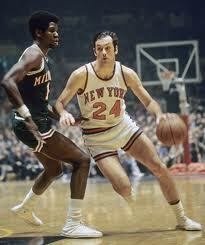 Following a distinguished high school and collegiate career and, for a renowned athlete, an unusual interregnum for a Rhodes Fellowship and voluntary military service, Bill Bradley played basketball professionally for the New York Knicks from 1967-1977. Bradley’s career was especially notable because his skills, although remarkable by many standards, were not of an order that in other professional team environments should have made for conspicuous success. The Knicks were unique, though, and Bradley fit into their intricate milieux in an indispensable and wonderful manner. The Knicks developed a variety of basketball rooted in vastly more unselfish concepts and conformations of group play, than, at the time, any other team could envision or sustain. Their visionary stratagems and heroically integrated performance perfectly suited Bradley’s personality and talents; and he perfectly complemented his teammates’. He was far from the most accomplished player in the National Basketball Association. But in the singular surround the Knicks constructed, Bradley always was effective and often was devastating. His history of play was interesting, too, because he seemed so intellectual, and so intellectually generous, an athlete. It wasn’t just that he invariably worked to maximize his teammates’ offensive and defensive opportunities. We also could see that, even in its most nearly solipsistic aspects, his game was intelligent out of all proportion to his physical skills; and always he was ebulliently communal. We often could see the signs of deliberative thought before and while he sought position on the floor, set, drove, defended, rebounded, passed, shot. We saw his face work with the invention of idea. We saw he consciously strained to produce the efficiency and value of his actions within the flow – or the occasional breakdown – of his team. More athletically gifted players, such as Walt Frazier or Earl Monroe, the team’s creative geniuses, or Willis Reed, the team’s heroic buttress and bulwark, were so skilled and existed in such graceful physical and spiritual relation with their skills, that they required none of Bradley’s more purely intellective purposiveness and willful resourcefulness. It was a joy to watch these decidedly different virtuosos accept, honor, and mesh their radically diverse gifts. I’ve never seen a more genuinely generous professional athlete. During his games his countenance worked not only with the industry and effort of self-demand but, often, with acclaim for others. Bradley grinned or outright laughed when his teammates played well. When an opponent performed an extraordinarily move, he frequently made most engaging gestures of responsive gladness. He would shake his head from side to side, for example, with something of a spectator’s celebrative elation. Or open his eyes with surprise and wonder. Or raise his hands with gleeful astonishment. Careful about his abilities, Bradley played the game in harmony with others’. Often, it seemed, on behalf of others’ – teammates and foes alike. This is uncommon and intriguing material. But Life on the Run is most affecting for its evocations of its author. Writing the book extended to Bradley, as the act of playing basketball evidently no longer could, a field within which fully to develop his considerably interesting attitudes about his country and culture, and his fascinating sense of what he repeatedly calls the “situations” of his existence as an athlete, a citizen, and a private person. The book is keenly alert to inequality and injustice. With startling intensity and ire Bradley talks with us about his gradual exposure to our country’s inequities, sickening bigotry, and dehumanizing squalor. He converses with particular vividness and grief about our society’s institutional mechanisms of isolation and loneliness. The locker room has become a kind of home for me, not simply a resting place. I often enter tense and uneasy, disturbed by some event of the day. Slowly my worries fade … I relax, my concerns lost among relationships which are close and real but never intimate; lost among the constants of an athlete’s life. Playing creates a release for my emotional energy. I have become dependent on the action, the physical contact, and the verbal bantering of the game … I pressed my physical and emotional life into basketball alone, and it made for a very intense feeling. Rarely do we find privileged persons expressing awareness of their blessings, and authentic gratitude for them. He seems scarcely to recognize that it is not only insulated athletes who find it difficult to envision, sympathize with, and respond to the gratifications and distresses of ordinary people’s quotidian lives. But this diminishes neither the significance nor the quality of his demand that he should learn to engage other people’s hopes, ideals, contentment, and suffering. Bradley’s approach to basketball expressed and served his self-imposed resolve to seek solidarity with others. Life on the Run consolidates and broadly expands his extraordinary commitment. “Loneliness,” he tells us, “can be overcome only by reaching out for contact.” In this sweet and serious work of his mind, Bradley greatly extends the more primal versions of “reaching for contact” he discovered and deployed as one of our country’s most successful athletes. During the latter stages of his first career it often had been said that Bradley meant to enter our country’s political life. That possibility could have seemed discomforting when it had appeared that a widely known athlete might have wanted to capitalize upon his celebrity solely for exploitative purposes. Life on the Run establishes that Bill Bradley is anything but exploitative in his imagination and his aspirations. The book makes it abundantly clear that the distinction and gracefulness of his play proceeded directly from his intelligence, and that its altruism derived from his character. This humane, tender, and responsible memoir tells an absorbing tale – and builds a compelling platform for its author’s further scales of possibility. As I noted at the outset, I wrote an earlier version of these reflections almost 40 years ago. 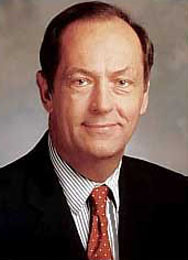 In 1977 Bill Bradley was elected to the first of three successive terms in the United States Senate, where he compiled a record of exemplary and effectual legislative leadership. In 2000 he conducted a bold campaign for the Presidency. It was marked by a singular command of the intricacy of the American nation’s economic structure, budgetary challenges, taxation quandaries, and excessive political partisanship. At great risk to his electability he articulated fervent concern and compassion for our country’s most disadvantaged and dispossessed citizens – and linked their terrible travails to manifestly unjust and eminently correctable imbalances in our polity’s policy preferences. He also voiced visionary concern about and resolve to address the now almost wholly ignored crises in our planet’s ecology and climate. Events in our national life subsequent to his retirement from politics have made it palpably apparent that Bill Bradley’s consciousness, discourse, acumen, and audacity were prescient and precious. I believe we sorely need his conscientious and courageous activism recalled to national governance, and reestablished in leadership.